Passengers will enjoy a "huge benefit" after the completion of a decade-long project to rebuild Britain's busiest railway line, network bosses have said. The £13bn modernisation of the West Coast mainline, linking London and Glasgow, is one of the biggest civil engineering enterprises for a decade. Track maintainer Network Rail says services will be improved and journey times cut by up to 30%. In January delayed work on the line caused travellers days of disruption. From Sunday, there will be more than 1,100 extra trains running on the West Coast line each week, a 50% increase in trains to Manchester and Birmingham and services almost doubling at weekends. New junctions and signalling equipment will also ease the flow of services. The line, which is used by 75 million people a year, will also be able to carry tilting trains with speeds of 125mph. Virgin Trains is the biggest beneficiary, with the completion allowing it to run a third more trains. The fastest London to Glasgow journey time will take four hours 10 minutes. Chief executive of Network Rail, Iain Coucher, said the travelling public and businesses would benefit. "What we've done this weekend is to raise the number of trains using it by another 1,000 a week. That gives an extra 60,000 seats on trains everyday, particularly for those people going into London," he said. "It's a huge benefit to everybody using it." Alan McLane, from Virgin Trains, told the BBC the ability to run more trains would allow the firm to offer another 13 million seats a year. "We have been running at 125 mph on the West Coast mainline for the last four years," he said. "But other work had to be done before we could get the full benefits from the modernisation of the route. "We're going through Rugby now at that speed instead of about 40. That's a huge improvement." Ashwin Kumar from the watchdog Passenger Focus said the works had caused disruption, particularly for leisure users at weekends and holidays. He said most passengers had been understanding about the work, as long as they had been given clear information about why it was being carried out and how it would affect their journey. "There had been a fair amount of disruption while engineering work had been taking place particularly in the past year," he said. "One of the frustrations of this year was the dispute between the train companies over the works schedule which meant timetables were published later than expected." He said overall the upgrade was "very positive" and more frequent trains would help ease overcrowding. But he said some towns - such as Nuneaton in Warwickshire - would lose out, as, in order to maintain their speed, fewer trains would stop there. The ticket systems and frequency of the trains using the line, also needed to be improved, he added. "If you're travelling between London and Birmingham, or London and Manchester, it's a fantastic service - every 20 minutes. "But increasingly, in order to get the cheapest tickets, you're having to buy an advance ticket, which means you can only travel on one specific train." Thousands of travellers were affected by delays to engineering work on the busy London to Scotland route at the end of 2007 and the beginning of 2008. 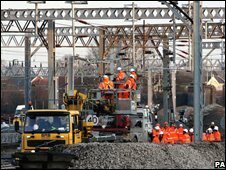 Network Rail was fined a record £14m for the overruns by the Office of Rail Regulation. Meanwhile, the Conservatives have unveiled plans for a new supervisory board to oversee Network Rail, with powers to sack senior executives if they fail to perform. Network Rail is currently accountable to its members, drawn from the rail industry and general public, and is regulated by the Office of Rail Regulation (ORR). But the Tories want to replace the members with a "strong supervisory board of passengers, train operators and business leaders". Conservative shadow transport secretary Theresa Villiers said it would end what she called an "accountability vacuum" created in 2002 when Labour set up Network Rail. The Tories would also give new powers to the regulator to block the bonuses of Network Rail bosses in the event of serious and persistent failure.